Enjoy special pricing on our 50 lbs. of Premium Kodiak Coho Salmon Fillets. Special includes 50 lbs. of Coho Salmon Portions, shipped overnight to your front door. Kodiak Coho Salmon Portions are boneless, individually vacuum sealed and flash frozen to assure premium taste. Our highly prized Premium Kodiak Coho salmon, also known as Silver Salmon are harvested in prime condition in the pristine open waters of Kodiak Island by our Sun'aq Tribal fishing fleet. 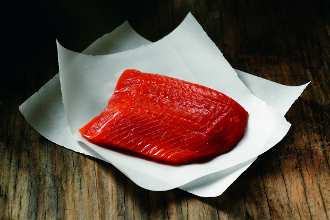 Kodiak's coho are valued for their delicate taste, firm texture and high omega-3 fatty acid content. Fish are individually handled and iced by our fishermen to stringent quality specifications and processed within hours of harvesting. Price Includes FedEx Shipping Across the US, direct to your front door.